Search Engine Optimisation is the process of ensuring your website can be found in search engines such as Google and Bing for terms that are relevant to your website. It is also a technique used to help your website rank as high as possible for the keywords you target. SEO is often seen as a web marketing technique (Search Engine Marketing – SEM) as it is an activity aimed to improve the visibility of a website in organic (non-paid) search results. SEO improves business. The fact is unless people are using your website, it does not matter how nice it looks. A website needs traffic and by performing SEO your business is more likely to have its website appear close to the top of search results for keywords in which you want to be found. Users tend to click website links closer to the top of page as they are seen as more relevant and simply quicker to get too. Search Engine Optimisation Tips and Tricks. A search engines will use a specific algorithm to determine what website will be ranked higher for the keyword combinations that a user searches. These algorithms are kept strictly confidential, but their general concepts and principles can be found if you spend some time and analyse search engine behaviour. WebIT have done the research to understand the SEO tips and tricks including web standards, using keywords including long tail keywords, meta tags, URL structure, sitemaps, webmaster tools, image alt tags, Google page rank and having various websites link back to your own website. WebIT also is aware of what is seen as bad for SEO such as iframes, flash based websites and duplicate content and can advise of alternative solutions such as paid search through Google Adwords. To know your website has an effective SEO strategy you must be able to effectively analyse the results. WebIT can install Google analytics to provide the necessary Search Engine analytics including the trends in visitors using your websites and the keywords people are using to find your website. Google analytics is a necessity with no ongoing costs. 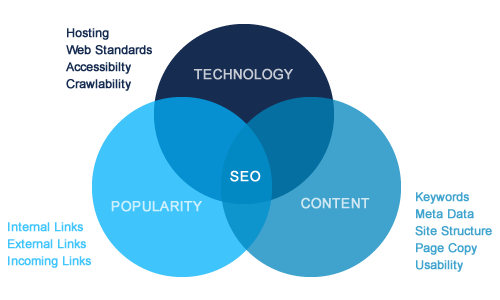 Professional and effective SEO will require changes to the HTML source code of a website and the website content. SEO tactics should be incorporated into website development and design. SEO begins with web development and as a web development company, WebIT have the knowledge and expertise to provide ongoing SEO solutions.